As an enthusiastic green-cleaning connoisseur, I’ve tried almost every DIY solution on the internet. Vinegar, baking soda, and castile soap are mainstays, but black tea, lemon juice, and peppermint oil are tucked into my arsenal as well. My cleanser of choice is vinegar – I use it to clean almost every surface in my home, and oh but I love its cheap and powerful non-toxic goodness. I recently learned that a simple paste of 1 part vinegar + 1 part salt will do double duty on extra-tough stains, tarnish, and mineral deposits. And that got me wondering: what else can salt clean? As it turns out . . . a lot! 1. Cast iron cookware. Fill the bottom of the pot/pan with oil, heat it a bit, and add a few tablespoons of coarse salt to form a paste which you can use to scrub-a-dub-dub. Rinse with hot water and wipe dry. 2. Enamel cookware. To clean enamel cookware and dishes, a paste made up of equal parts salt and vinegar will do an excellent job. 3. Burnt pans. For those burnt crusties on the bottom of pans, apply a sprinkling of salt as soon as you’re finished cooking. This will help the sticky stuff come up later. 4. Grossly greasy pans. To deal with extra greasy pans, add a bit of salt and then use a piece of paper to buff. Follow with a normal wash.
5. Stove spills. Clean oven and stovetop spills with a mixture of salt and a dash of cinnamon. The salt absorbs liquid and both salt and cinnamon fight odors. Keep this mix on hand so that you can cover spills ASAP. Wait to cool completely before wiping away with water. 6. Coffee maker. To clean your automatic coffee maker’s glass pot, add a few tablespoons of salt to the water and bring the whole thing to a boil. Cool and rinse. 7. Coffee stains. To remove stubborn coffee stains from cups, use a sponge to rub them with a paste made from salt and vinegar. Rinse with water. 8. Metal polish. To shine most metals (steel, silver, gold, pewter), make a paste of equal parts salt, flour, and vinegar. Use a cloth to rub it on, leave for an hour, then rinse with water and wipe dry. 9. Chrome polish. 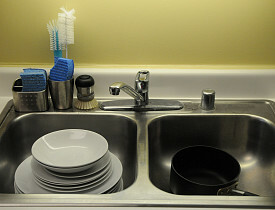 Shine up your chrome (sink faucets and other fixtures) with a mixture of 2 tablespoons salt and 1 teaspoon vinegar. Buff with a rag, rinse and wipe dry. 10. Copper and brass polish. To shine up copper and brass, take half a lemon, squeeze out the juice (reserve for another use), then sprinkle salt inside the rind. Rub this all over the brass/copper, rinse and dry. 11. Rust remover. To remove rust from metal, make a paste from salt, cream of tartar, and water. Apply the paste and let the item sit in the sunlight to dry. Buff clean. 12. Drain freshener. For regular cleaning purposes, heat 1 gallon water with 1/2 cup salt till nearly boiling. Pour into your kitchen sink drain to remove odors. 13. Fridge freshener. Wipe down the inside of your refrigerator with a simple mixture of salt and soda water. It works, and there are no strange smells to infiltrate your food. 14. Cutting board cleanser. Buff and brighten your cutting boards once in a while after use. Just rub them with a damp dishcloth dipped in salt. 15. Sponge solution. Keep your sponges fresher, longer, by soaking them in a salt water solution after cleaning with them. 16. Wood restorer. To deal with water cup rings or other marks on the surface of wooden furniture, make a paste of vegetable oil and salt. Rub it in with a rag, then wipe off. Also good for treating nicks and dents. 17. Carpet cleaner. Treat your carpet stains with a paste of ¼ cup salt and 2 tablespoons vinegar. Rub it in gently, allow to dry, and vacuum clean. 18. Mildew remover. To treat mildew stains on cloth, apply a paste of equal parts salt and lemon juice. Hang in the sun to dry. Follow with normal laundering. 19. Laundry brightener. Whiten and brighten faded or yellowed linens. In a washing tub or large pot, add 5 tablespoons salt and 1 tablespoon baking soda. Boil 15-30 minutes, then remove and rinse in cold water. 20. Soap scum scrub. Remove soap scum from bathroom tile by scrubbing with a solution of 1 part salt in 4 parts vinegar. Wipe clean with a damp rag. For help with green cleaning your home, find a reliable cleaner in your area.